Only 12h 47m 33s left! 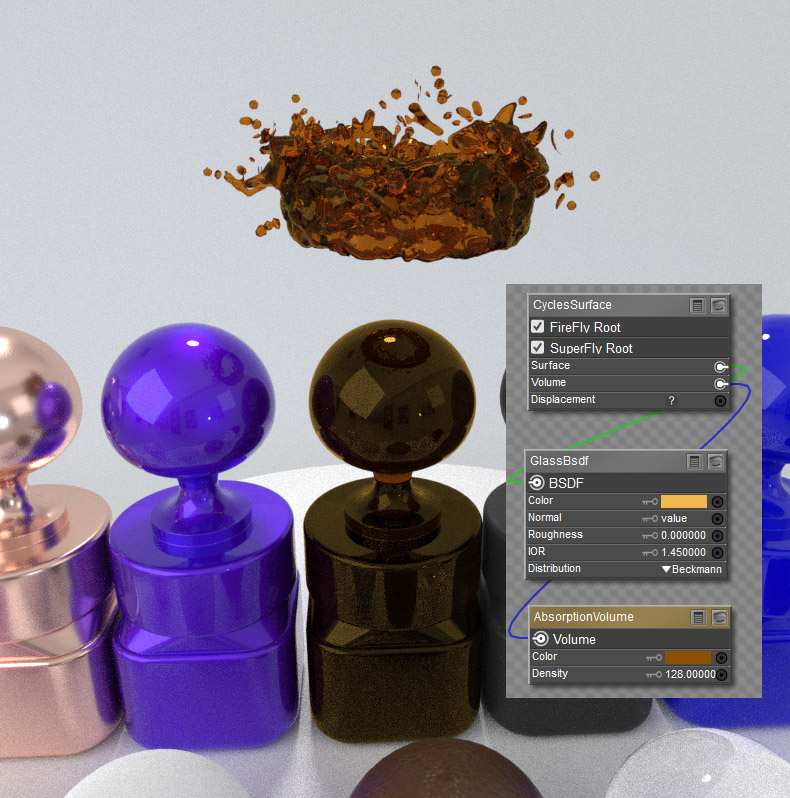 I saw one of your comments in another thread about the coffee shader. Here is one that is super easy to make. here is another super cool, super easy material: Glow-in-the-Dark! 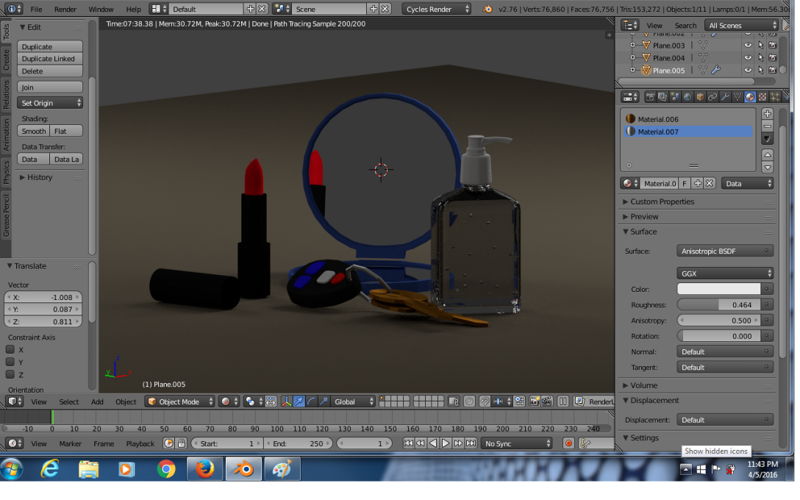 Ready for Halloween renders. This is Poser11????? As soon as my computer comes back, I am going to open it up and play around it again. Smiles are contagious... Pass it on! WOW! Ghostship, thank you ... I sure needed that coffee today!! The other shaders are amazing too!! And this is what cycles is all about! Fantastic. Yes folks, here is why I'm so excited about Poser 11! bb and I had mentioned this in a thread at SM months ago ... Rust on metal with displacement. (we discovered a stretching problem on the pawn mesh and haven't continued). I lost my shader from that test. I had it partly with the physical shader ... clouds, granite ... and I believe I used a second layer in the mat room. Ghostship and I tend to watch the same Blender Guru videos. There's one there about rust on metal. I'm thinking though that I may be replacing any displacement maps from now on with Normal maps though. 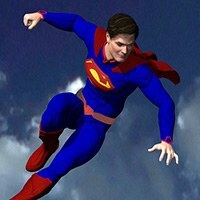 Clark? Would normals have any detail or what is the hight limitations? I'd better see those videos and get up to speed. My problem with normals is that I can't paint them in Photoshop. 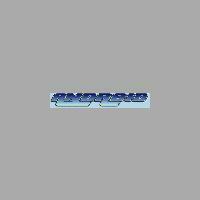 I need a special program like Crazybump to do them and that is way out of my budget. I'll stick to gray maps for bump and displacement. 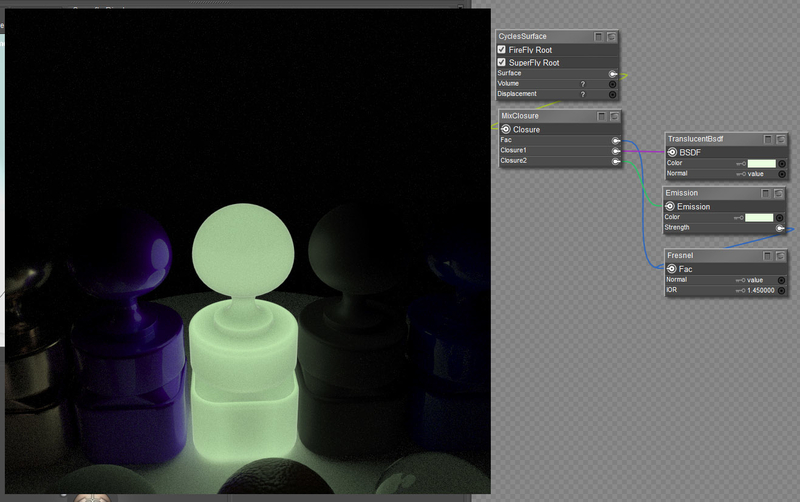 Here is a variation on the Glow-in-the-Dark shader. Fiber Optic. 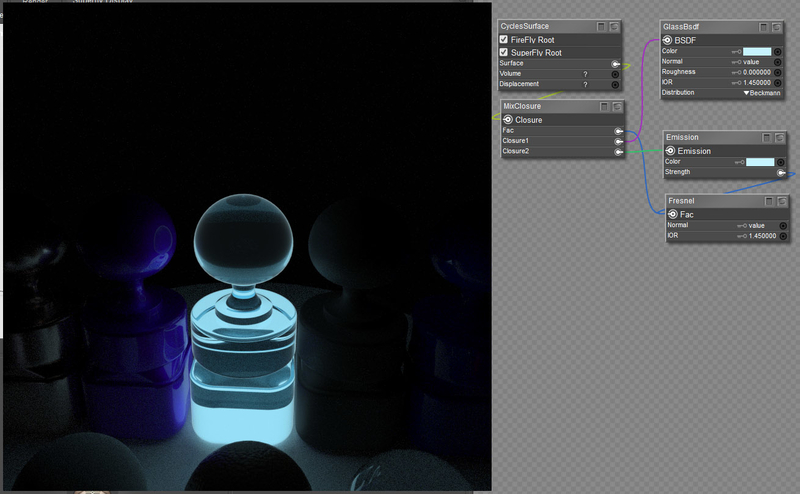 I swapped out the translucent node for a glass node. 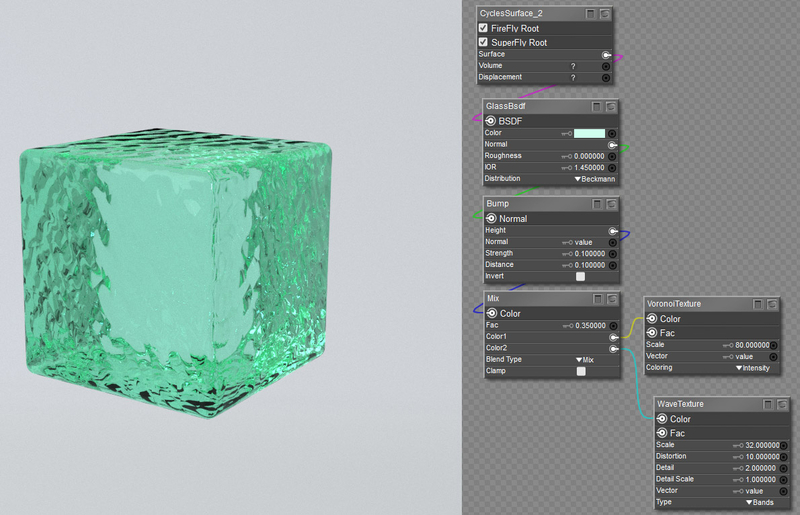 play with the roughness on the glass node for different looks to it. There's a thread somewhere over at Hivewire and RamWolf lists a free utility for making normal maps. I'll see if i can find it and post it. IIRC, NVIDIA has a Photoshop plugin for creating normal maps. GIMP has a built in script. Both free. ShaderMap can generate those also; it is far cheaper than Crazybump. The beer one is good.. Problem is beer needs bubbles. Andrew has a tutorial for that too. It's little details like that that help sell the realism. 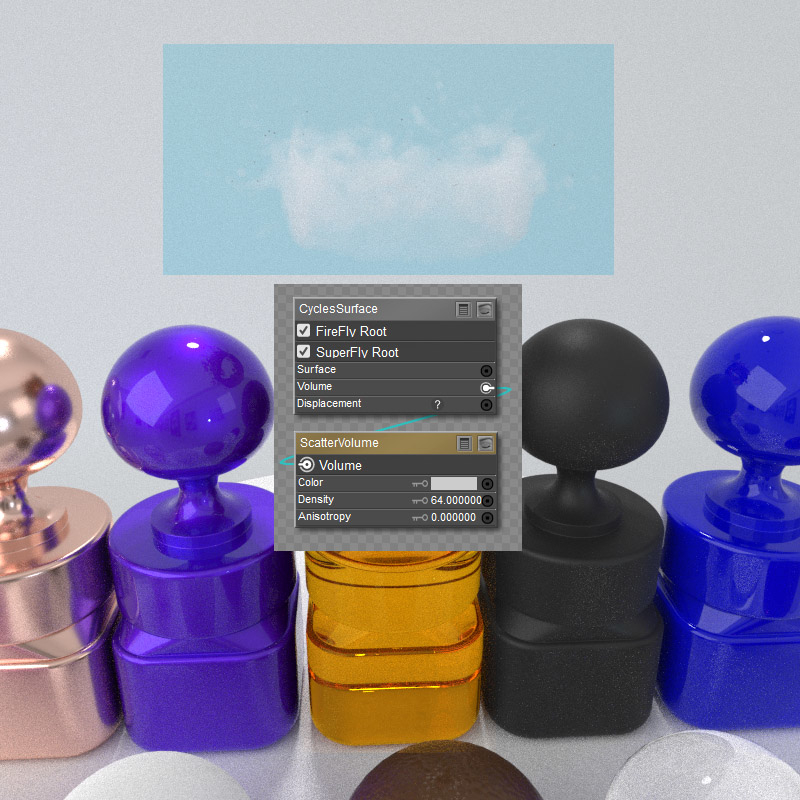 You don't have to make the bubbles in Blender though. even the Poser ball should work well enough, but it could get tedious placing all those bubbles. I did some hand sanitizer and that wore me out. I have not watched his beer tute. I'm just noodling around at this point trying to see what I can come up with. Trying to keep them simple so people can follow the nodes. This is a great thread, I am sure a lot of users will benefit a lot from these posts. I'll keep them coming. If other have some cool shaders to share that would be awesome as well! 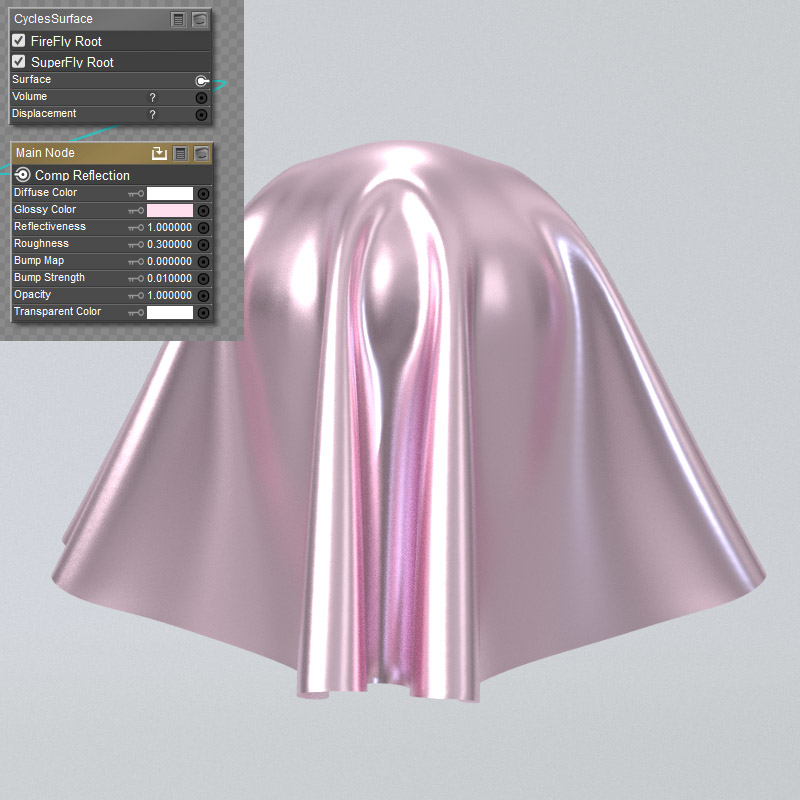 set up my free shader to slightly rough metal, tint it pink and slap it on a dress and it becomes satin. Does any one have any cycles tutorials that are free? And I will look into making normal maps in place of displacement. 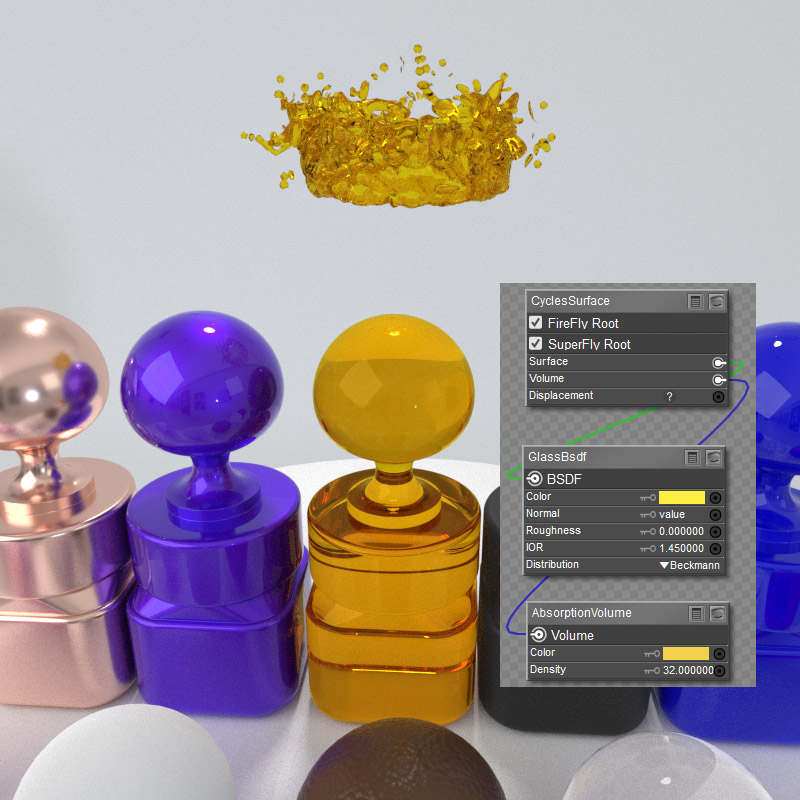 Maybe some of our users can suggest materials they would like to have in Superfly/cycles to challenge our masters. Let me start with brocade. Frost on glass. Peeling paint. The best ones that I've seen so far are by Andrew Price at Blender Guru. He has a youtube channel. I've linked to it before so you may have seen them already. 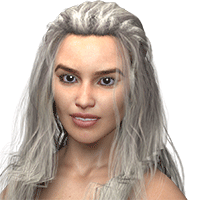 here is a link to the Blender Cycles Shader Encyclopedia. Some detailed explanations of what the main Cycles shaders do. El Cheapo Pool Water. You'll need to adjust the scale of the Wave and Voronoi textures to fit the scale of your model and posibly the bump strength or distance value. here is another fun one. 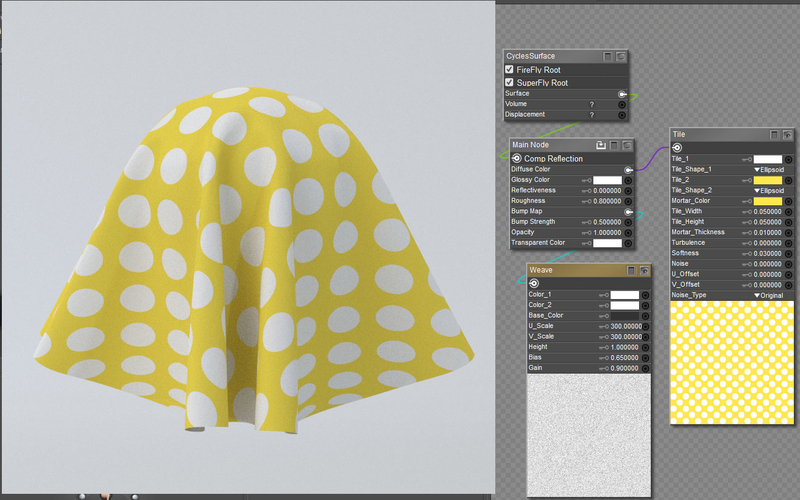 Cloth made from my shader with procedural color and bump. Hey EClark, thanks! Link is bookmarked and I'll check it out tomorrow. 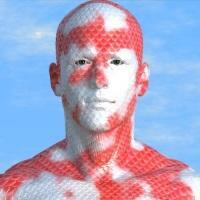 Poser is a normal map generator. You don't need to make normal maps from height maps using a third party tool. That's already built into Poser - just use the height maps. There is a benefit to normal maps but it's not applicable here. The benefit is that the .1 to 2 seconds it takes poser to convert height to normal is too much when animating in real time. So for real time animators, they want and need a normal map. For those who are doing 2 to 100 minute renders, the effort of pre-converting a height map to normal is is not worth it at all. 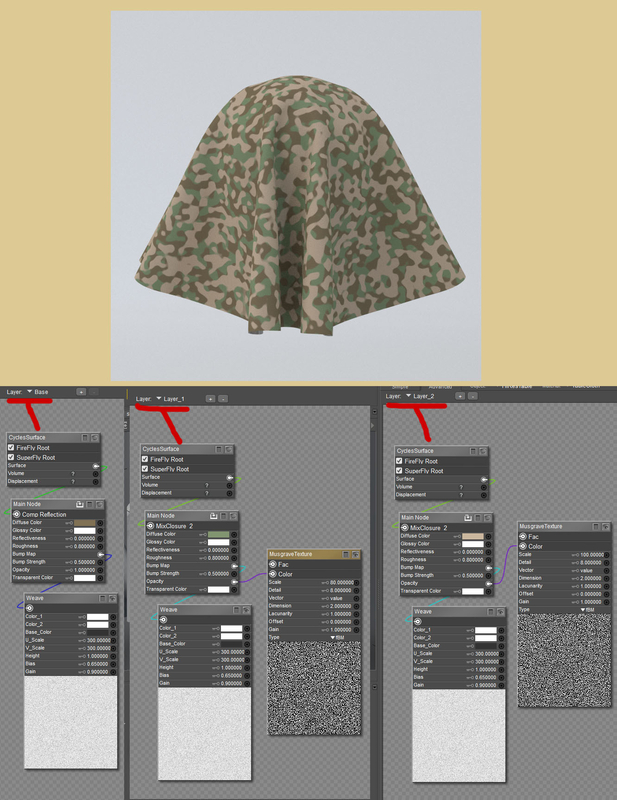 Stop telling people they should use normals when they're using Poser, not some real-time game engine. 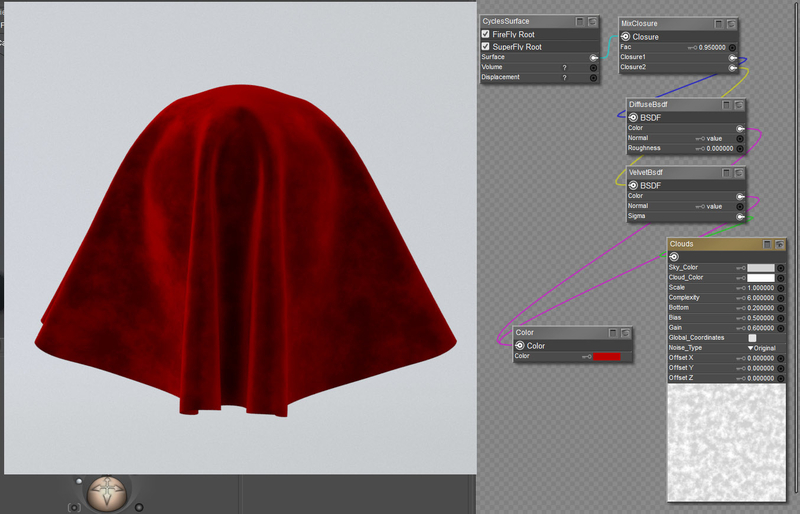 Note: If you're STARTING with normals, as you would if importing game assets, then Poser let's you use the normal map. It doesn't demand you use it but if that's what you have to begin with, then go ahead. But don't go out of your way to convert a bump map into a normal map. That's like flying to Cleveland to pick up a car which you then drive to your corner grocery store. You could have just walked. Yes walking is slower than flying and driving, but not if you're flying and driving 1000 miles vs. walking 300 feet. I had the same thought last night before going to bed. The Cycles shaders take normal maps but there is a converter node (bump) that converts a gray map to a normal for the shader to use. No real need for an actual normal map. I've already included this node inside my shader thing so all you need is the gray map on the outside. I use Blender, Poser and I'm trying to keep DS in mind when I make things, so I'm thinking a normal map might come in handy. No one has to use it it they're opposed to it.